Your home most likely has windows on just about every room and every level. The windows allow light into the home and can be opened to allow fresh air to come in. You need to clean the windows regularly to remove any debris and sediment that might be damaging the actual window. There are some ways that window can be damaged and broken in some way. Once a window is broken, chipped or cracked, it is no longer strong and will need to be replaced or repaired. The windows will need to be replaced by a professional that has the tools and capability to remove the old window and install the new one. Stress Crack in Window Glass: A stress crack that is found on a window is from a few factors. The main way that a stress crack appears is when the weather in the house is drastically different from the weather outside. The crack will normally appear form the outside edge of the window and slowly work its way across the window. It is often found when the weather outside is extremely cold and then you choose to crank on the heat in the house. If the change is too fast and too quick the change will sometimes cause a crack to appear. It does not have to just happen from the weather change from inside and outside but it can be from the outdoor temperature only. A huge shift in the weather can cause the stress crack to appear. If you notice that you have a stress crack appearing on your window you want to call to have it repaired or replaced. Shattered Glass Window or Door: When you have an impact break in your window you most likely will know what it is. The window is broken by some outside impact. That can be from a baseball thrown in the wrong direction. It can also be from a rock that is shot out from under the mower or out of a child’s hand. Whatever the impact is from you will need to take caution when cleaning up. The window in this case will be shattered quite a bit and takes some finesse to remove the broken bits. You want to clean up any pieces that have fallen out of the window and on the floor. Then steer clear of the area so that a professional can do the removal. The shards of glass can easily become dislodged and will become dangerous. Pressure Cracks in Glass: This is an uncommon type of crack but can still happen. 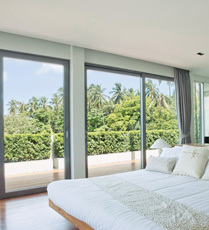 It seems to happen most often when you have double pane windows or insulated glass windows. The pressure crack can be caused from the window installation. If it is placed too high or too low the elevation can cause the glass to crack. The crack has a specific type of look and is the shape of an hourglass when it starts to spread. 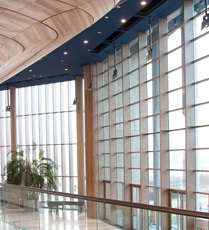 Rohan Glass Company offers a myriad of glass services including installation, replacement, repairs and more. 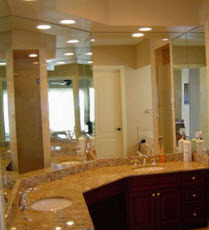 Contact us for all your glass and mirror needs!